A Problem Report (PR) has been cleared for what is being described as a “scratch” on Endeavour’s left Solid Rocket Booster (SRB) – following a Focused Inspection at Pad 39A. 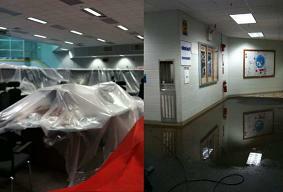 However, the Launch Control Center (LCC) has suffered from flooding after a pipe bust on the fourth floor. STS-130 remains in a good stance for launch at this time, with summary presentations from Wednesday’s Agency Flight Readiness Review (FRR) confirming the “clean” review. Endeavour has a few days of contingency in her pad flow – should they be required – as engineers prepare the stack for the opening mission of 2010. Most of the flow this week has related to the continued closeouts on the orbiter. “Orbiter: OV-105 / ET-134 / SRB BI-141 / RSRM 109 (Pad-A): Orbiter aft closeout is in progress and continues through Friday. STS-130 Cryo Sim was successfully completed. GO2 recharge at the high pressure gas battery is scheduled (end of week),” noted processing information on L2. Ordnance installation was completed earlier in the week, with only one issue – relating to a power supply – noted during the procedures. “New IPR (Interim Problem Report) 0048: Taken during power up after Ordnance installation. During ground power supply activation, the sequencer stopped due to (a) power supply failing. (Engineering) reported there was an indication of a failed fuse in the power supply,” added the NASA Test Director (NTD) on the flow report. No images are currently available of what is being described as minor damage on the left SRB, as engineers waited for the removal of an External Stowage Platform (ESP) in the location to allow for a Focused Inspection to take place. However, as expected, evaluations via a Focused Inspection on the booster cleared it to fly-is – with high level evaluations commonplace for any issues relating to shuttle’s hardware. A new report on Friday morning noted a burst FIREX pipe on the fourth floor of the LCC has resulted in the closure of the Firing Room – it is too early to know if this will have an impact on the launch date until the extent of the damage is known. However, all four floors of the LCC are affected. “At appox 20:25 on Thursday, the LCC experienced a FIREX pipe burst that flooded multiple floors,” noted the NTD on Friday morning’s processing update (L2). “The LCC is currently contolled for essential personnel only. Endeavour remains on track for next weekend’s opening launch attempt, following the final FRR for STS-130 was conducted at the Kennedy Space Center (KSC). With all departments polled as “go” for the opening launch attempt on February 7, the next key meeting will take place via the Mission Management Team (MMT) L-2 (days) review. Such was the nature of the trouble-free FRR, only a handful of special topics were reviewed by the gathered managers and engineers, opening with the Node 3 ammonia (NH3) lines that had initially threatened reduced mission content, a delay, or even a mission swap – until engineers created two back-up solutions. “It was a very clean review and all organizations polled go to proceed. Excellent progress has been made with the ammonia hoses to be used to integrate Node 3 into the existing ISS thermal control system,” noted an overview of the FRR on L2 – which also contains over 50 STS-130 FRR presentations. 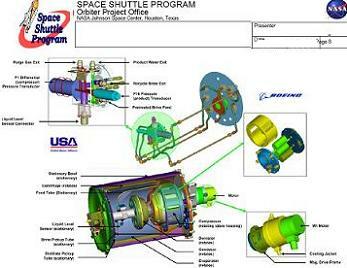 Other topics included the troublesome Urine Processing Assembly (UPA) and Water Processing Assembly (WPA) on the International Space Station (ISS), with a large part of the docked mission dedicated to the swap out of a replacement Distillation Assembly (DA) on the UP, which is riding uphill with STS-130, prior to the failed unit being returned on Endeavour. “The Urine Processing Assembly (UPA) is expected to be recovered by R&R of the Distillation Assembly (DA). The failure of the DA is attributed to high calcium concentration in the urine. The calcium precipitated out blocking the recycle line and causing flooding events and ingestion of urine into the compressor,” added the overview. “Once the DA is R&R’d, the plan is to limit processing so that the urine is less concentrated and the calcium does not precipitate out. Since this has implications to RFTA (urine brine tank) resupply, a longer term solution will be investigated. Also related to the ISS, managers discussed an item of concern related to the 2A solar array – which has led to fears the array may be damaged. The STS-130 crew have been instructed to take photographs of the array, in order to allow engineers on the ground to make further evaluations. “The 2A solar array longeron shadowing event was discussed. A Beta/temperature induced anomaly with the 2A BGA (Beta Gimble Assembly) latch resulted in the array being out of position such that it experienced a longeron shadowing event. Reconstruction of the event indicated that the buckling limits may have been exceeded. “A Dedicated Thruster Firing Test of the 2A array showed a significant difference in the frequency compared to model predictions, whereas thruster tests of other arrays have showed good agreement. This has led to the concern that the 2A array may be damaged. “A photo survey was performed and no damage was detected. However, there is still the potential for damage since it could be below the detection capability of the survey. With a very short IFA (In Flight Anomaly) list from the previous flight of the shuttle via Atlantis during STS-129, managers had only a few resulting “actions” to add to STS-130’s FRR, aiding the smooth review. “The Shuttle Program presented previous anomalies and first flight items but are not working any issues,” added the overview, before noting the only other open item – which was also cleared at the FRR – related to the radar ships which track the shuttle’s ascent as part of the debris event recording assets. Several articles based on the specific FRR presentations will be published in the lead-up to STS-130’s launch.